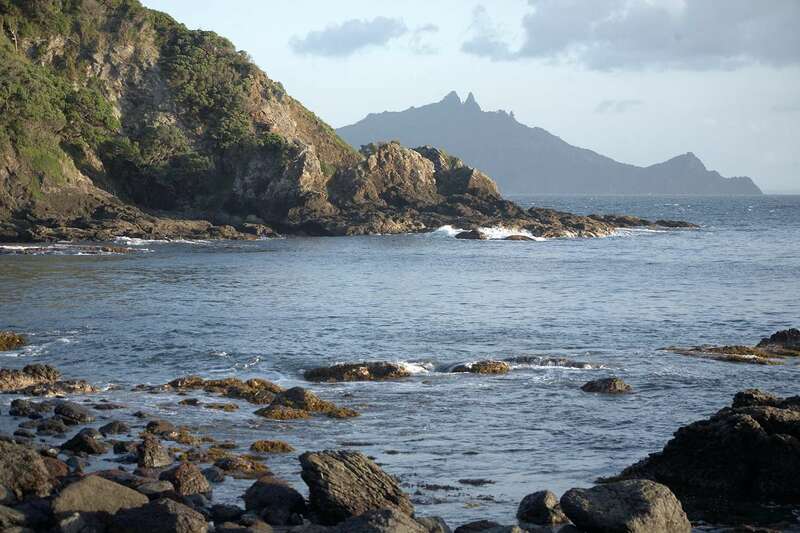 The Hen and Chicken islands are a familiar landmark located some 10 to 19 km off the Whangarei coast. From 28 March to 6 April this year, four of us (Robyn Blyth, Raymond Thorley and Jean-Claude Stahl from Te Papa, Kalin Lewis from Ngati Wai) stayed on Mauimua / Lady Alice island, the largest of the “chickens” or Marotere islands. 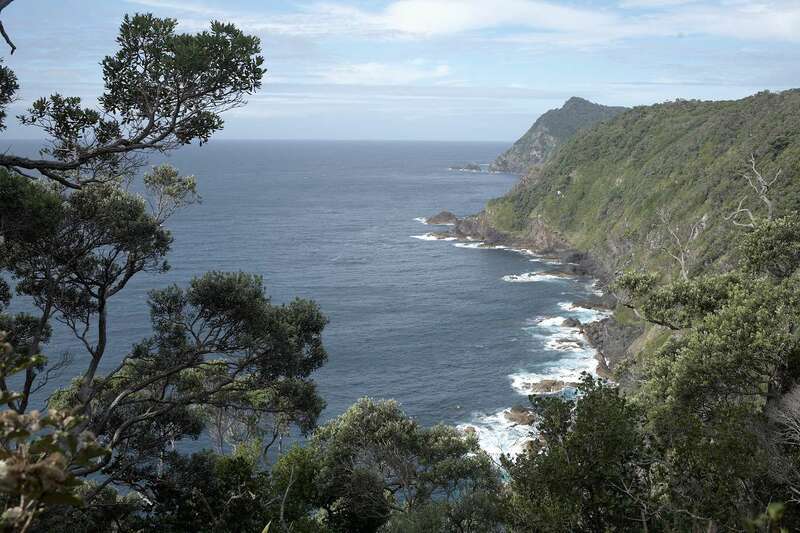 Although focused on flesh-footed shearwater research, the field trip provided an opportunity to make observations on the vegetation of the island, which is quite exotic looking when coming from Wellington (same applies to the climate!). The 155 ha island is about 2 km long by 1 km wide, rises to 158 m above sea level, and is mostly surrounded by greywacke cliffs or steep rocky slopes. The only sand beach is at West Bay or Grave Bay, so named because a child that had died on an immigrant ship was buried there in about 1840. West coast of Lady Alice, looking south towards Taranga / Hen Island (background). Photo Jean-Claude Stahl, Te Papa. 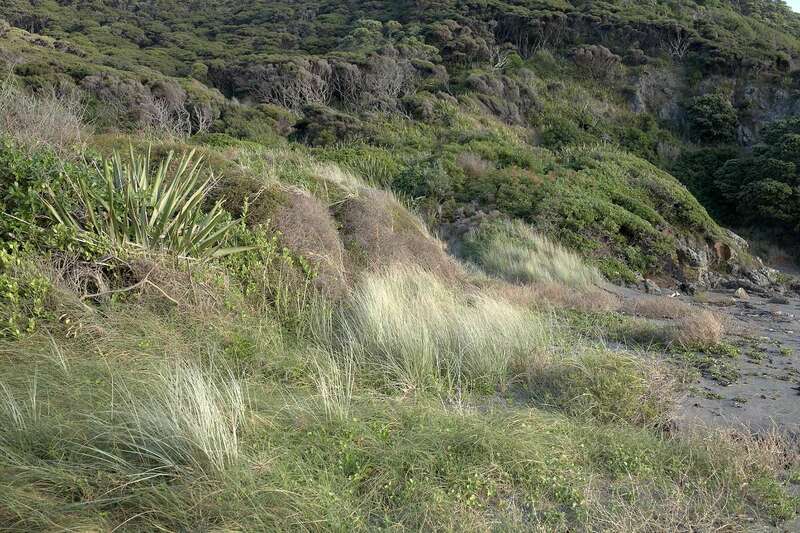 Landing in West Bay, the first vegetation belts to be met are sand binding plants on a small consolidated dune (Calystegia sp., Carex pumila, Spinifex hirsutus, Muehlenbeckia complexa), or, on the rocky promotories that delimit the bay, a coastal scrub of taupata (Coprosma repens), ngaio (Myoporum laetum), flax (Phormium tenax), houpara (Pseudopanax lessonii) and Melicytus novae-zelandiae. Sand beach with Carex pumila (foreground), spinifex and Muehlenbeckia complexa, West Bay. Photo Jean-Claude Stahl. Coastal scrub of taupata (left), houpara (centre foreground) and flax, West Bay. Photo Jean-Claude Stahl, Te Papa. 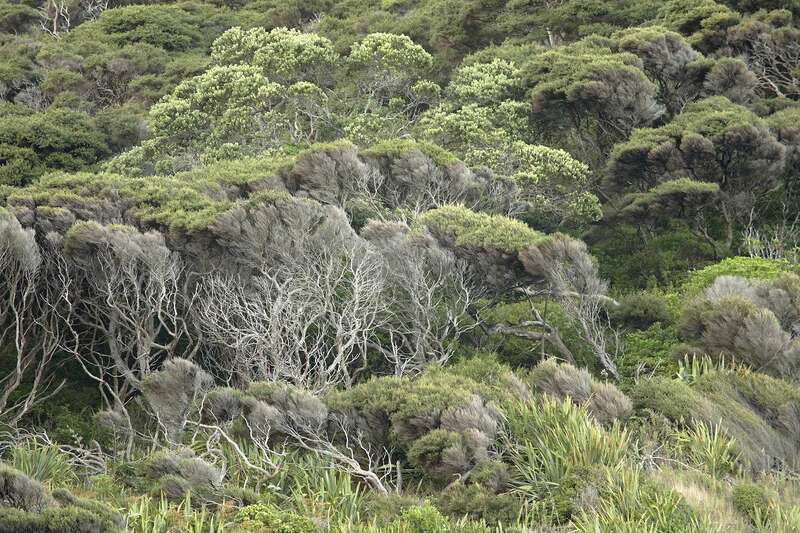 Melicytus novae-zelandiae (centre left) and taupata at the seaward margin of coastal scrub, West Bay. Photo Jean-Claude Stahl, Te Papa. 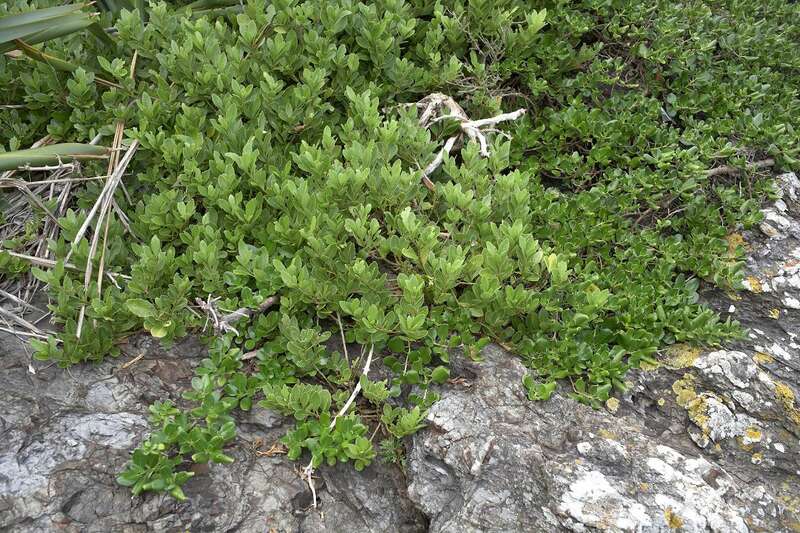 The upper boundary of the coastal scrub is in places marked by magnificent stands of pukanui (Meryta sinclairii, also known as puka), one of the great sights of the island, as the Hen and Chickens and Three Kings islands are the only localities where this familiar ornamental plant grows in the wild. This unusual distribution led to speculation that pukanui was introduced to the Hen and Chickens, presumably from the Three Kings, by their former Maori inhabitants. 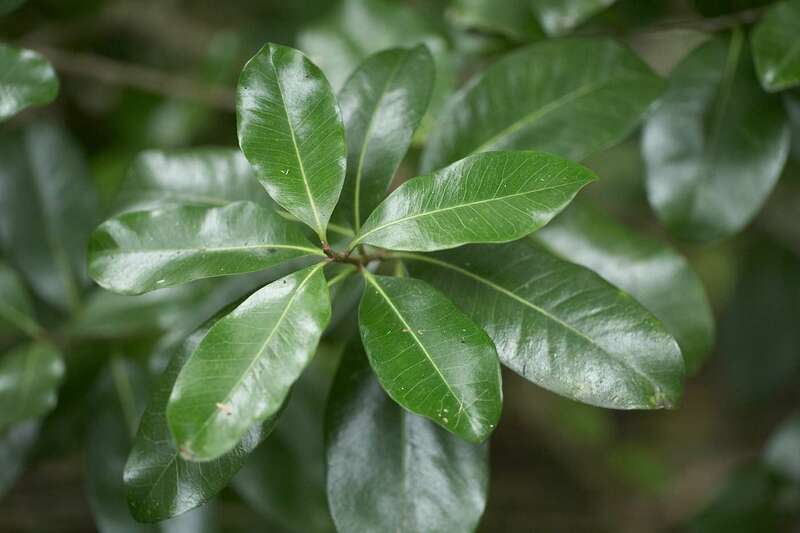 Pukanui was described from a lonely plant seen at Whangaruru harbour by Colenso around 1840. 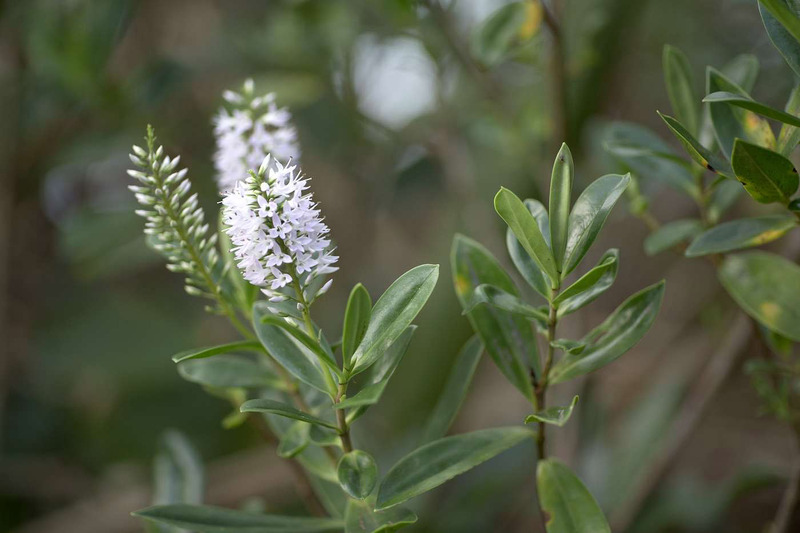 This specimen had indeed been planted by the local Maori, who informed Colenso that they had brought it from the close-by Poor Knights islands – where there has been no sign of the plant since. Belt of pukanui at the boundary between coastal scrub and pohutukawa forest, West Bay. Photo Jean-Claude Stahl, Te Papa. Pukanui and flax thicket, West Bay. Photo Jean-Claude Stahl, Te Papa. 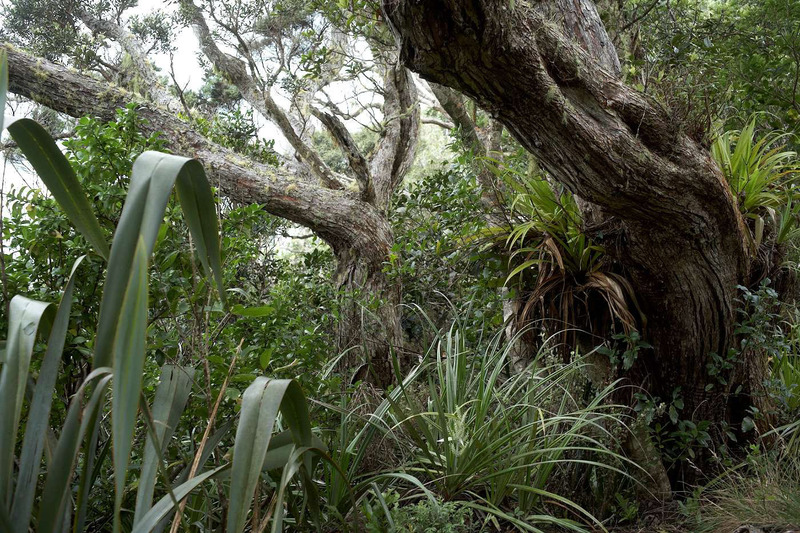 Pohutukawa forest extends quite far down in sheltered bays, but often retreats to the upper slopes of the exposed high cliffs of the north coast, above extended belts of halophytes and costal scrub. 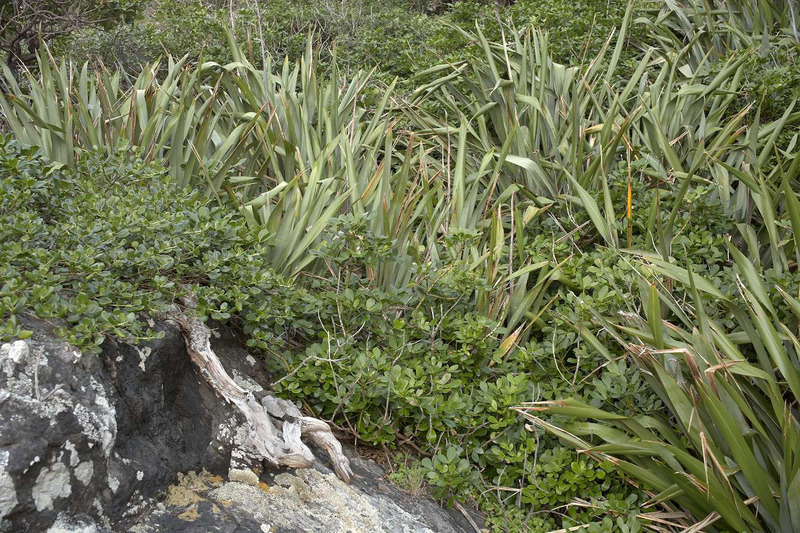 Also scattered in this clifftop forest are coastal maire (Nestegis apetala), with a rich understorey of flax, coastal astelia (Astelia banksii), haekaro (Pittosporum umbellatum) and Veronica bollonsii, the latter endemic to the Hen and Chickens, Poor Knights and the Tutukaka coast. Dolphin Bay on the north coast of Lady Alice, looking east towards Whatupuke island (background). Photo Jean-Claude Stahl, Te Papa. Pohutukawa forest on north coast clifftop. Flax and coastal astelia in foreground, Collospermum hastatum epiphytic on pohutukawa. Photo Jean-Claude Stahl, Te Papa. 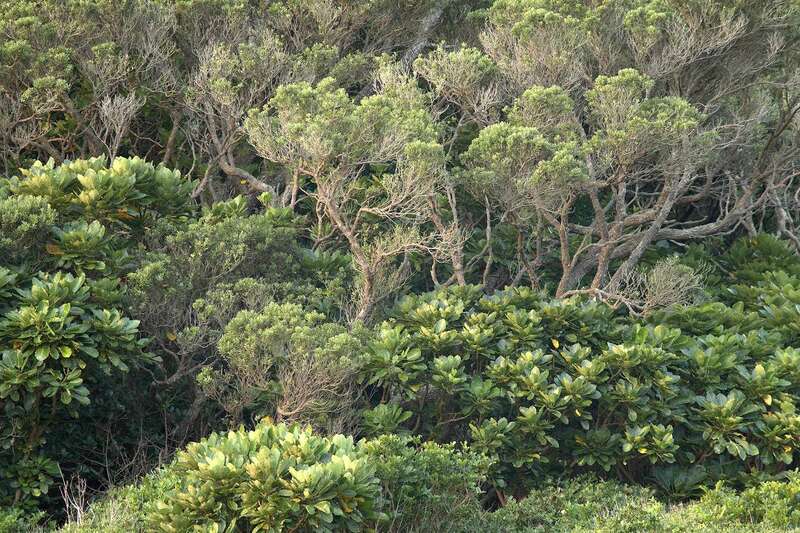 Flesh-footed shearwater colony under clifftop forest of coastal maire (left) and pohutukawa, north coast. Glossy green groundcover plant is Peperomia urvilleana. Photo Jean-Claude Stahl, Te Papa. Haekaro in fruit, north coast ridgetop. Photo Jean-Claude Stahl, Te Papa. Veronica bollonsii, north coast clifftop. Photo Jean-Claude Stahl, Te Papa. 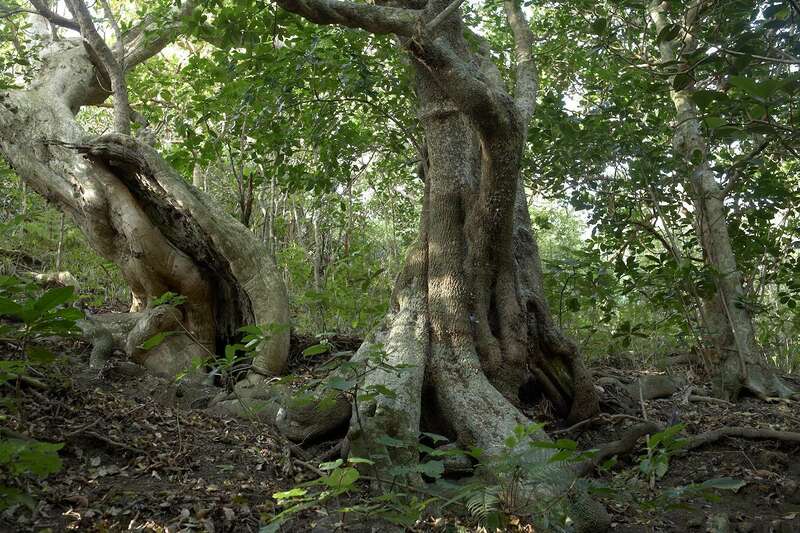 The lushest vegetation of the island is found in a few remnants of old growth forest in the headwaters of valleys inland from West Bay and South Cove, and in gullies running down the east coast. 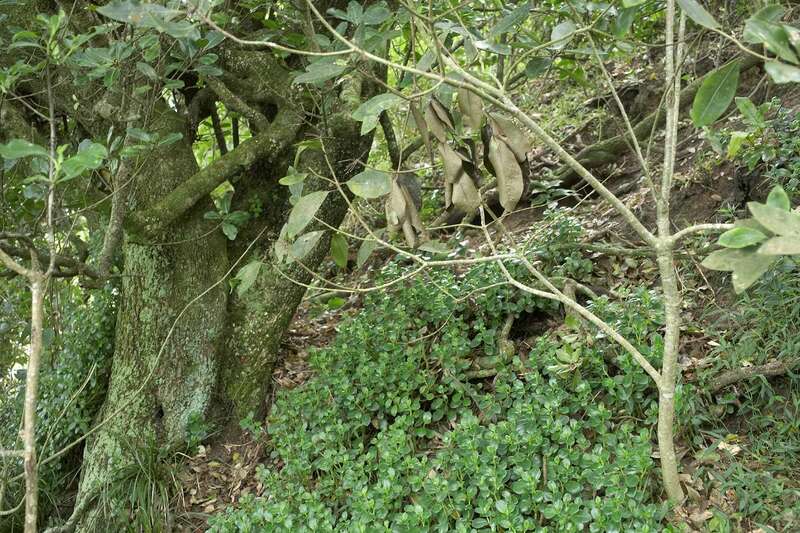 These stands are dominated by large pohutukawa and puriri (Vitex lucens), with younger kohekohe (Dysoxylum spectabile) and karaka (Corynocarpus laevigatus) as subcanopy, and groves of large puriri and coastal maire growing on the drier stony slopes around such catchments. Another spectacular tree, the parapara or bird-catcher (Pisonia brunoniana), grows here in damp areas along stream beds. 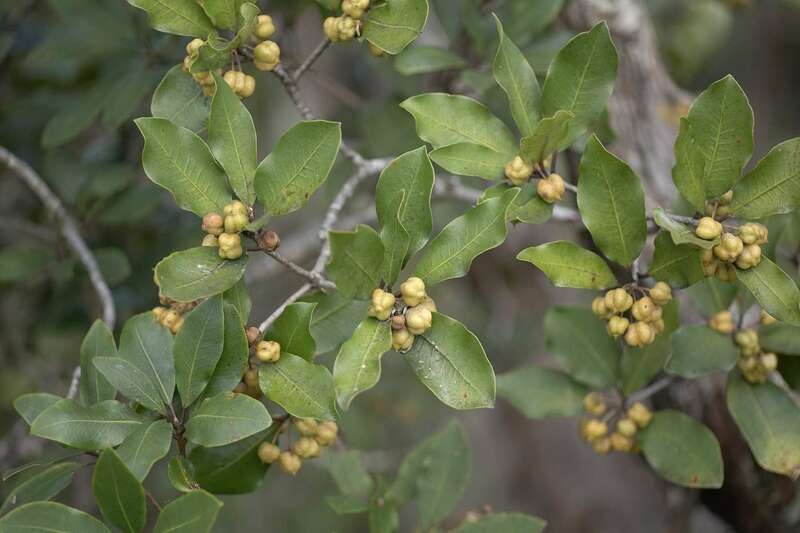 The tree gets its name – and bad reputation – from its sticky fruits that can become death traps for small birds like silvereyes or fantails, although seemingly well designed for long distance dispersal by seabirds. Old growth puriri, pohutukawa, kohekohe and karaka forest remnant, gully inland from South Cove. Photo Jean-Claude Stahl, Te Papa. 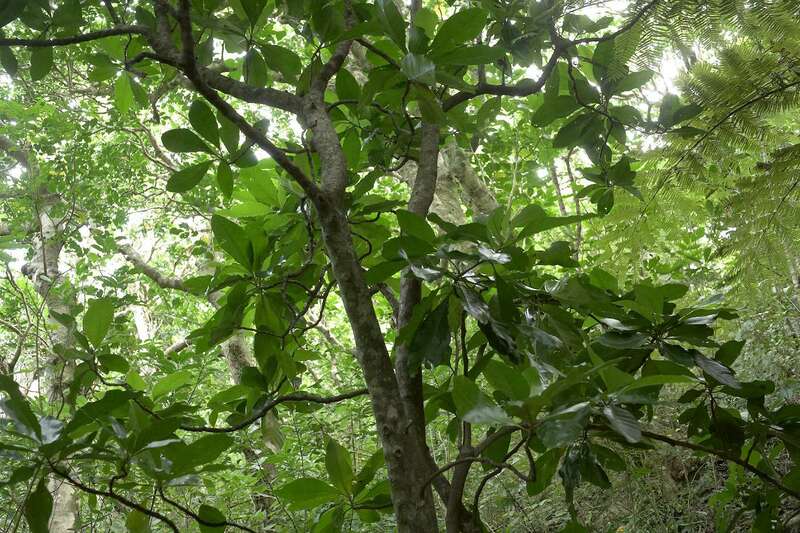 Parapara (foreground) and ponga under a canopy of puriri and kohekohe, gully on east coast. Photo Jean-Claude Stahl, Te Papa. 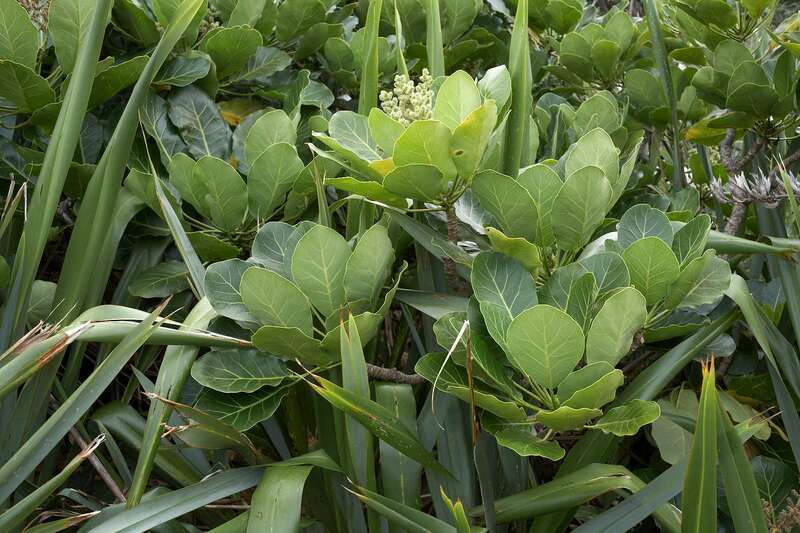 Puriri (left), coastal maire (centre) and karaka on south facing slope inland from West Bay . Photo Jean-Claude Stahl, Te Papa. Coastal maire foliage. Photo Jean-Claude Stahl, Te Papa. 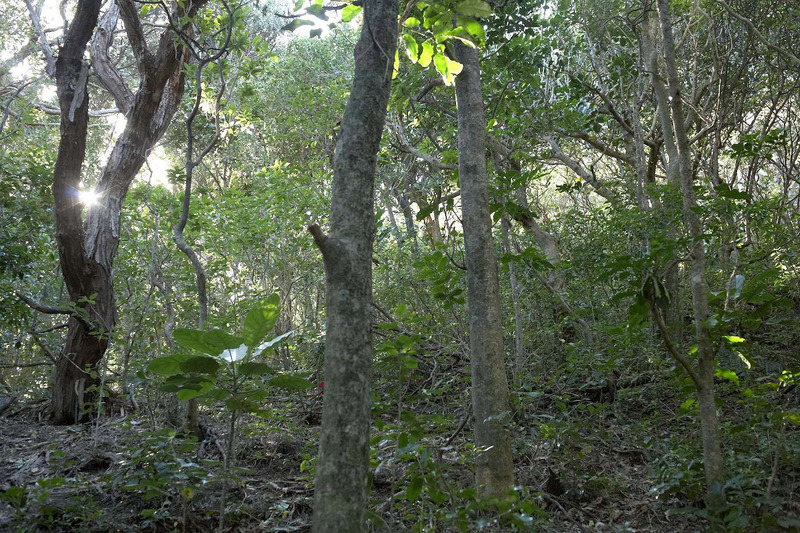 Extensive tracts of kanuka (Kunzea ericoides) scrub, especially around West Bay, attest to a fair deal of modification of the original forest. Former Maori inhabitants had established three ridgetop pas and plantation terraces, but seemingly deserted the island after 1821, and by 1880 the Austrian naturalist Reischek described the large Marotere islands as mostly forested, except for abandoned Maori plantations covered in flax and scrub. More recent modifications include repeated fires, with the last extensive one in West Bay in 1902-03, and browsing by cattle up to 1928. 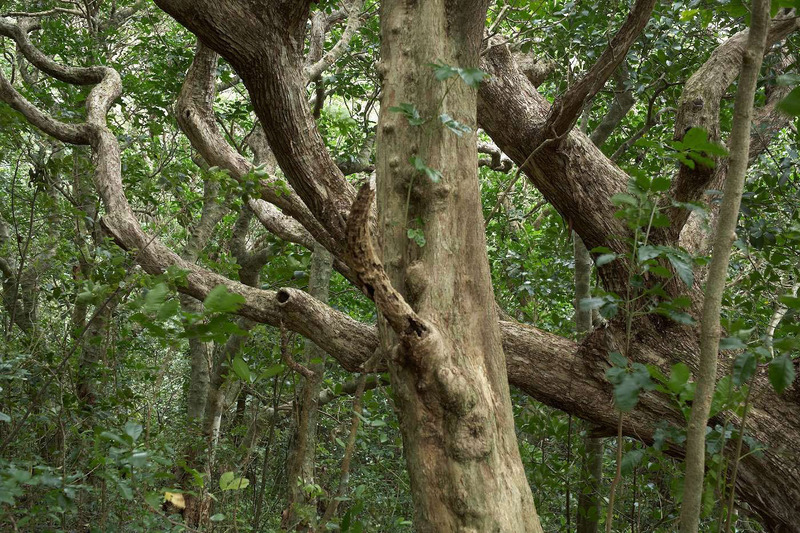 Kiore has been removed in 1994, and the island is on an advanced path of recovery, with extensive regeneration of kohekohe forest under the ageing kanuka canopy. Kanuka scrub, West Bay. Photo Jean-Claude Stahl, Te Papa. 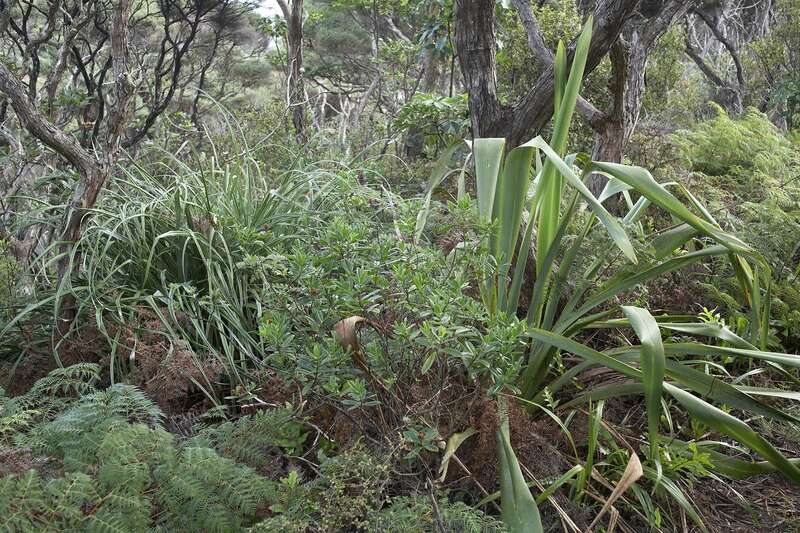 Ridgetop Kanuka scrub with groundcover of flax, bracken, coastal astelia (left) and Veronica bollonsii (centre). Photo Jean-Claude Stahl, Te Papa. Kanuka (left), kohekohe (main canopy) and pukanui (foreground), slope inland from West Bay. Photo Jean-Claude Stahl, Te Papa. By Jean-Claude Stahl, Te Papa. Nice photos and information on various plants and trees.